Today is one of those lovely days when the sky is "Adirondack Blue," a color I didn't know existed until I moved here. When it is this clear and blue in February in the Adirondacks, it is generally pretty chilly. It was ten below zero at the homestead this morning, but the air was clear, so we have "Adirondack Blue." There is actually a Ralph Lauren paint color called "Adirondack Blue," and a potato named "Adirondack Blue," and Roy Hurd even wrote a song called "Adirondack Blue." The song refers to the sky, so that one makes sense. 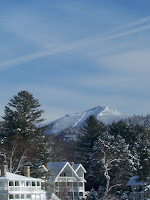 Today's featured photo is a shot of Whiteface Mountain taken from frozen Mirror Lake, on the way to the Prudential Terry Horrocks Real Estate office where I work in Lake Placid.